Thank you Anna 🙂 We did and I hope that you too had a very Merry Christmas! I was telling some people at dinner tonight about your building an igloo for your penguin so now I’m gonna have to send them the photo. It’s wonderful!!!! Thanks for posting it tonight. I’ve seen a lot of penguins in peoples yards but only yours has it’s own igloo. 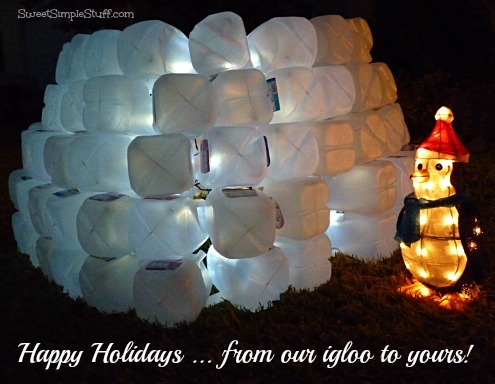 Thank you Tavette 🙂 This is the igloo that inspired me … http://www.squidoo.com/milk-jug-igloo … mine is much smaller. I watched part of the video. WAY too much work so hats off to you. Your penguin looks SO cute-cute-cute standing next to his new home so it was a labor of love but at least your little guy wouldn’t have been cold Christmas night. I hear igloos are really warm. Thank you so much…love the pics! I hope you had a wondrful Christmas! Thank you Peg 🙂 We did and I hope you did too! Thank you Bobbi 🙂 I wish you and your family the same! Thank you Karene 🙂 Merry Christmas!